Unless you are a diabetic or a person who has a loved one who suffers from diabetes, you may have no idea what diabetes is all about. How constant it is and in actual fact, how life threatening it can be. It is a hard condition to manage and you may not even consider the daily vigilance an individual needs to have, in order to keep a tight reign on their blood glucose levels. 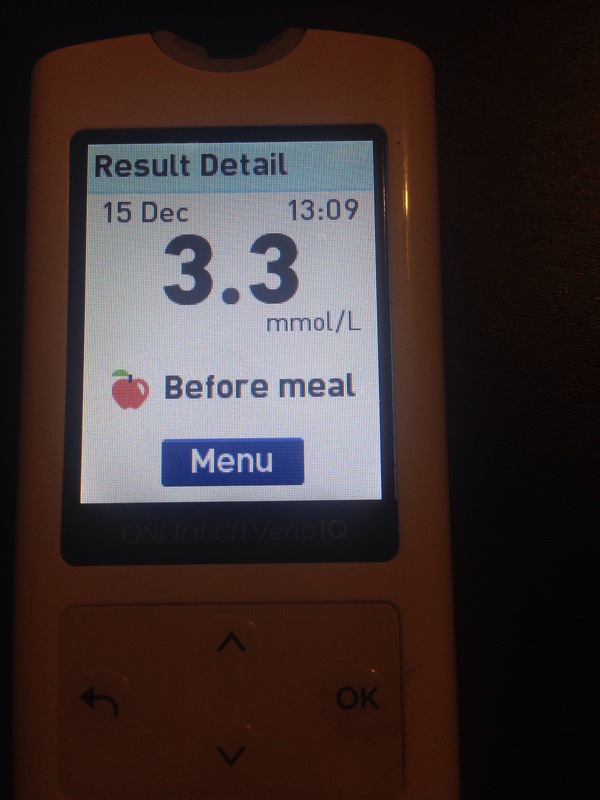 I thought the best way to develop an understanding of what day to day living with diabetes can be like, was to give you a glimpse into the sort of days I can have. Every day is unpredictable. 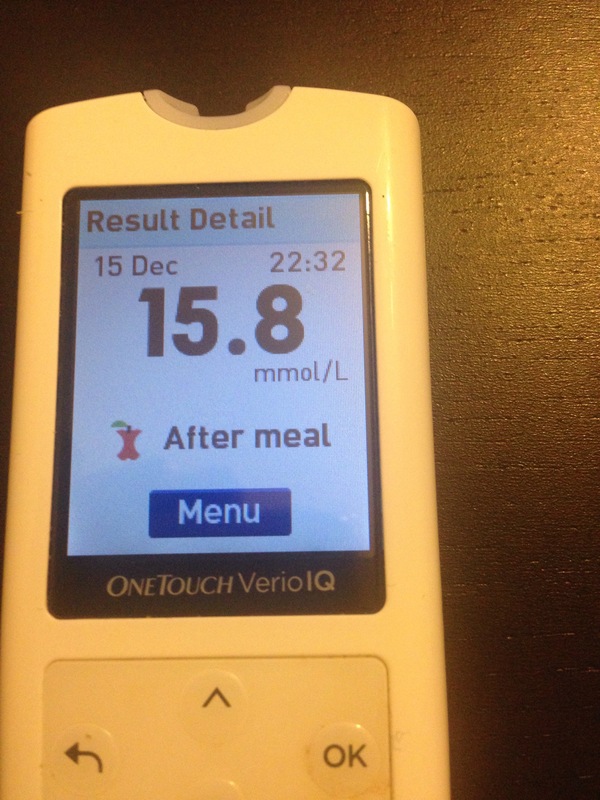 December 15th– I decided to pick a random crazy day, so you can truly see how up and down sugars can be. The day starts with the night of the 14th. The perfect Blood sugar reading to go to bed with. After a heavy pasta dinner that night, I’m pleasantly surprised. 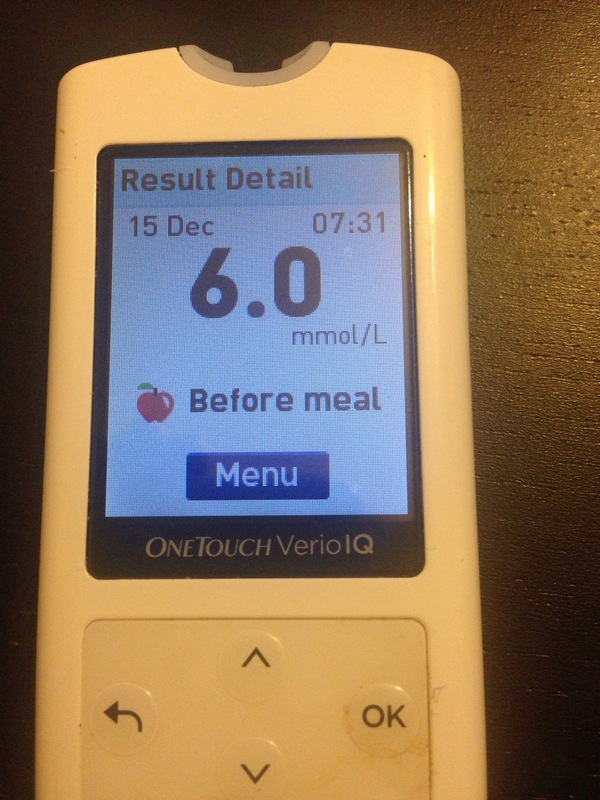 I usually aim for a BS between 6.5 -7 mmol/l before heading off to bed. Although 6.5mmol was a great reading, it’s become a habit to always make sure that i’m prepared for any lows in the night. It saves me from having to make that journey down the stairs, or disturbing my husband. Although he say’s, “he doesn’t mind”. I sometimes feel bad that I’m disturbing his sleep too, but if I really can’t make it I do ask him. I head off to bed and a few hours later I reach a point in my sleep, where I’m fighting to open my eyes. I’m using every last bit of energy I have to try and get myself up. It isn’t just the feeling of being tired and not wanting to open your eyes. It’s a real struggle, one which means your draining every last bit of energy you have in your body. I tend to have this feeling, when I’m hypoing, but you can never be too sure so I decided to check my blood sugar level. 02.36 am – Reaching for my blood glucose meter I feel very weak. My pj top is soaked. 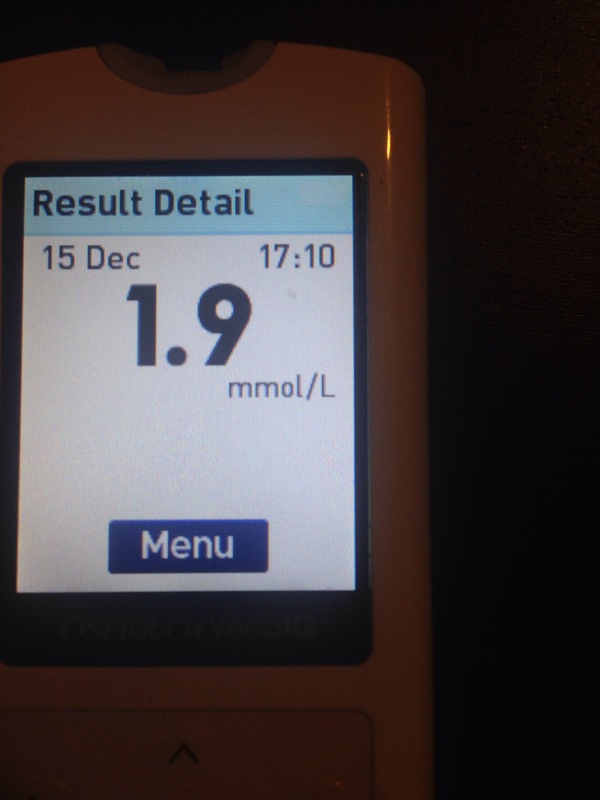 It’s definitely a hypo. Thank god I brought up all those goodies the night before. I check my sugar level and low and behold, I’m having a pretty low low. To correct my low blood sugars I usually give myself 15g of fast acting carbs. This usually comes in the form of Lucozade (which by the way isn’t so great in the early hours of the morning). But this is diabetes, being forced to wake up in the middle of the night to eat or drink something, when all you want to do is sleep. I dare not just go back to sleep! So, after having my Lucozade I waited 15 minutes, I sat on the edge of my bed in my sweaty pjs. NICE! I watched the time as it ticked by slowly. The thing about hypo’s are, they can make you feel quite ravenous. In that momment, you’d do anything to get back to feeling more like your usual self again. Knowing that the food consumed will allow me to return to this normal state, sometimes I am guilty of consuming more than the 15g and waiting for my BS to increase. Resisting an over correction is one thing but on that night I found I wasn’t able to wait the full 15 mins without checking my BS level again. 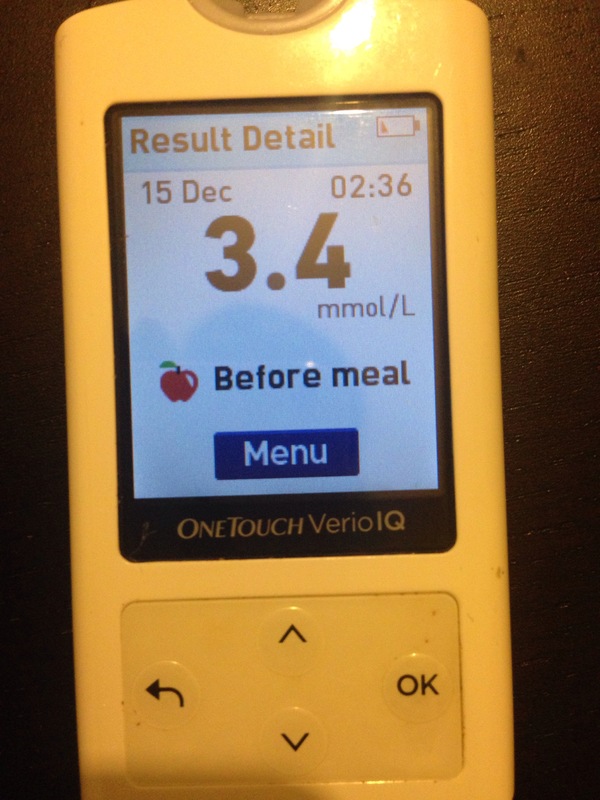 7 minutes later, at 2.43 am, when I tested my BS I got a reading of 3.4 mmol/l. Hmmm it hasn’t budged yet!!! Do I wait till I reach the 15 Mins? Nope! I go straight for the apple and satsuma. 02.55 am – And yes I’ve finishedboth fruits in record time. BS reading is now 4.0 mmol.l. Great finally its starting to come up! I wait a little bit longer and test my BS at 3.30am 5.0 mmols/l. Maybe I was safe to go back to sleep now. At this point I’m feeling even more exhausted than ever. In a sitting position I rest my head against the headboard and fall into a very deep sleep, until my alarm goes off at 6.30am. The rest of the day went a little something like this…. 22.32 BS reading a few hours after dinner. This was definitely a rebound BS. I’m happy to report that after a crazy couple of hours my sugar settled and fell more in the normal range again. PHEW! So just remember, the next time you see me looking all tired, or I make mention of feeling exhausted. It’s possible that I had a crazy night like this one.